This last week was a very busy week to say the least. We started with our First Steps Dinner, where we invite all the visitors that have attended our church for the last 3 months, and had great results. One parent, of one of our teenagers of the church, came for the first time to our church and I was able to lead him to the Lord after the dinner. I was thrilled to hear that this man was a worshiper of the “santa muerte” (holy dead), but now he has become a worshiper of the true God and Savior. On Tuesday we started our Bible Institute. This is our 6th year! We started teaching 8 different classes from Tuesday to Thursday from 8 am to noon. 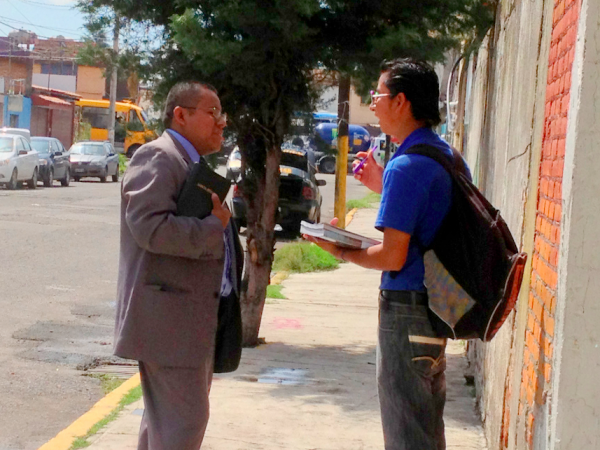 We also have preaching during chapel and go out soulwinning on Wednesdays with the students. Last week on Wednesday we had 8 people saved during the soulwinning time! The class before we go out soulwinning, we have the personal evangelism class with Bro. Moises Garrido, who is a graduate from Pastor’s Kevin Wynne Bible Institute and just arrived to Puebla to start a new church. On Thursday, while on chapel, one dear lady of our church named Agar, started to feel sick. I ended taking her to the hospital with her son. She almost had a stroke! Now she is on medication. She and her 25-year-old son attend our Bible Institute. Agar is a retired professional nurse. Many years ago, when she received the lump sum of her retirement money, she gave it all to help to buy the church property. About $30,000 dollars. Please pray for this dear lady, she is a dedicated soulwinner and she loves the Lord. On Friday night, my wife thought a great lesson during her monthly lady’s meeting. We had 32 ladies in attendance, all of them from our church. They had games and a good time of fellowship. My 9-year-old daughter Sarah made the curtains to decorate the event. She and Rachel (now 11) learned to saw while we were on furlough in a church in San Marcos, CA. 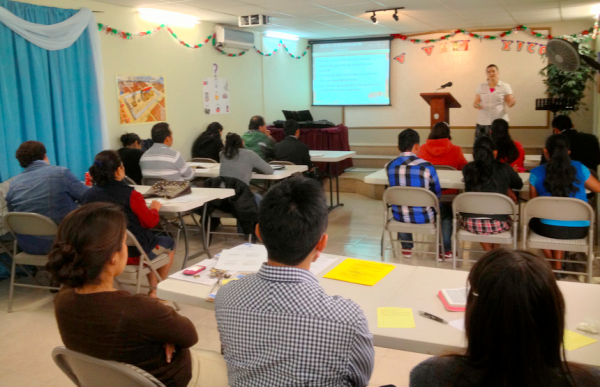 Last Saturday we had a two-hour workshop to teach our teachers how to teach a Sunday School Class. We had a good group from our church and from the mission church. They were amazed by all the information Nicole gave them. 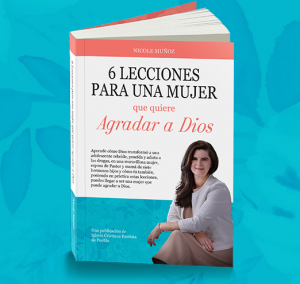 We also video-taped it, and we are going to put it on our Spanish website so that other churches and Sunday School teachers can downloaded. Right now we have more teachers than space to teach. We desperately are praying for the land next to us so that the owner will be willing to sell it. The street in front of our church is being totally repaired right now. It’s one of the main arteries of Puebla and we had the privilege to buy our property in this very busy street called 11 Sur. One security man, that watches over the heavy equipment, was walking in front of our church on Sunday night and I invited him to come inside and listen to God’s Word. He happily agreed, and after the service he got saved! We also had 10 visitors on Sunday! Please pray for Nicole, she has tendonitis and her wrists hurt very much. She is doing better. Pray for the expansion of our building as we need more space to put more chairs. 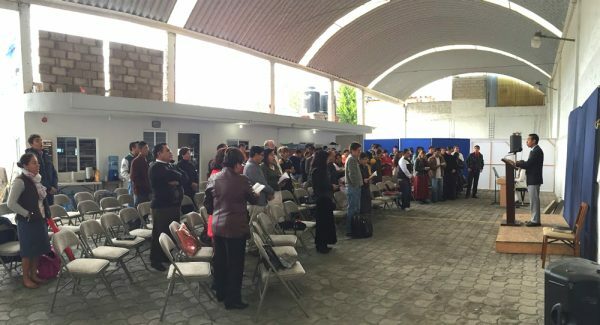 Pray for our Bible Institute.